Rising dampness is the classic form of damp that most people think of when they talk about damp dwellings. As the term implies, it is caused by moisture rising from the ground in porous wall contruction via capillary action. Visual signs of rising dampness – damp staining appearing on the inside wall and reaching to one metre or so above external ground level . This is often combined with damage to skirting board and decorations. External and internal chimney defects (where a fireplace has been blocked in). Leaking external water supply pipes and draines. High ground levels, new drive ways, paths or tarmac bridging the damp proof course. Cracked or deffective external render. 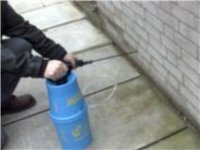 The Damp Proofing London SW rising damp specialists in London South West provide solutions to rising damp using low hazard and water based ingredients – Chemical Damp Proof Course ( DPC ) injection. The Damp Proofing London SW warns you that rising dampness and any damp problems are risk for your health. The Damp Proofing London SW recommend that a survey is carried out immediately if any damp problem is suspected. The causes of damp are more often than not difficult to diagnose. The reason is the problems are hidden, even though the symptoms can be evident and sometimes because there are several causes acting at the same time. Buildings lacking in maintenance and those which have had an inexpert attempt to cure damp (only made matters worse or hid the symptoms) are difficult to diagnose. There are many sources of moisture ingress, from missing slates of damp proof course ( DPC ) to defective damp proof membranes, and to identify every defect which is allowing water to degrade a dwelling requires an expertise which can only be gained from many years of training, experience and practical involvement in building construction and refurbishment. The damage caused by water is very often concealed behind plaster, under floorboards, in brickwork etc. Leak can remains undetected for long periods allowing huge reservoirs of water to build up and be contained within the fabric of the building and only by following a ‘Trail of Suspicion’ can the original source be traced and remedial measures contemplated. To sum this up, you need to find a damp specialist who will concentrate not on a single treatment but will offer you a comprehensive diagnosis, identify the cause and suggest the relevant course of action. It is only by constant practical involvement this knowledge can be achieved to diagnose the hidden causes of water ingress and its consequences for the property. Damp Proofing London SW are rising damp specialists in London South West and other Londons areas.On the right hand side of this page you can see photos of one of our recent jobs – rising damp treatment in London South West. If you need rising damp treatment in your property call rising damp specialists in London South West – Damp Proofing London SW now on: 08448 841 757 or 07552 949 123.